In deepest rural Worcestershire, there are many fine wedding venues, from small bijou establishments through to grand castles. Few however can match the rustic settings of Curradine barns, where we found ourselves recently, playing at the wedding reception of Carolyn and Gary. While the wedding party enjoyed the top class in house catering, we set up our equipment in the usual fashion – quickly and with no disruption to the guests (one of the benefits of performing up to 85 bookings per year is that we work like a well oiled machine). After the wedding breakfast and speeches, guests filtered in to the performance room and bride and groom took their place on the dance floor for their first dance – “Heaven”, by Bryan Adams, played by Hard to Handle band. The natural acoustics of this converted barn added to the strength of the song, and of course, our performance of it. And then we treated all present to two hours of great sounding live music, all upbeat and designed to keep everyone on the dance floor. 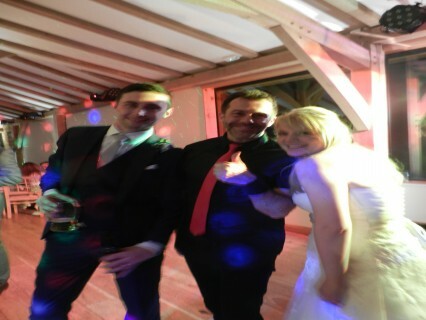 “We just wanted to say a MASSIVE thank you to the guys for playing at our wedding on Saturday night, they were truly fantastic and Gary, myself and ALL our guests were thoroughly impressed with their professionalism, entertainment and of course – sounded incredible! What a great atmosphere – Absolutely made a great end to great day, we couldn’t have asked for more! Have we piqued tour interest? We hope so. Feel free to call us direct on 0796 433 5657 for more information on Hard to Handle band.